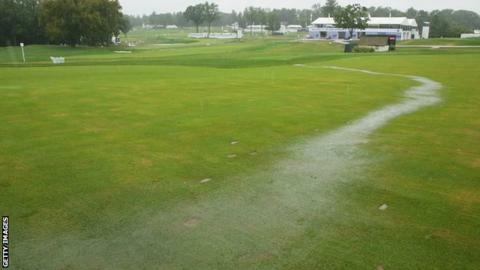 The final round of the BMW Championship was postponed on Sunday. PGA Tour officials declared the Aronimink course in Philadelphia unplayable as persistent rain fell. They postponed the final round until Monday, but with more rain forecast overnight there is no guarantee they will be able to complete the penultimate FedExCup play-off event. That means third-round leader Justin Rose could be declared the winner - and also gain the world number one ranking. Schauffele fell out of a tie for the lead when he missed a 10-foot putt to bogey the final hole of his third round. Rose needs to win to displace American Dustin Johnson and become the 22nd man and fourth English golfer to be world number one since the rankings began in 1986. The BMW Championship is the third of four FedExCup play-off events on the PGA Tour.